Sarah Thebarge ponders the intersection of faith and medicine in this insightful narrative of her medical mission trip to Togo, West Africa. Sarah Thebarge, a Yale-trained physician assistant, nearly died of breast cancer at age twenty-seven, but that did not end her deeply felt spiritual calling to medical missions in Africa. Risking her own health, she moved to Togo, West Africa-ranked by the United Nations as the least happy country in the world-to care for sick and suffering patients. 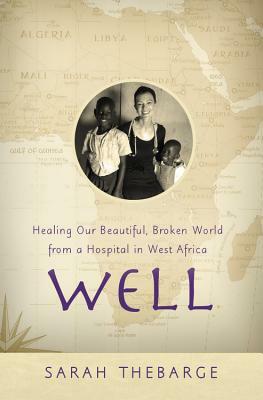 Serving without pay in a mission hospital, she pondered the intersection of faith and medicine in her quest to help make the world "well." In the hospital wards, she witnessed death over and over again. In the outpatient clinic, she daily diagnosed patients with deadly diseases, many of which had simple but unavailable cures. She lived in austere conditions and nearly succumbed herself in a harrowing bout with malaria. She describes her experiences in gripping detail and reflects courageously about difficult and deep human connections-across race, culture, material circumstances, and medical access. Her experience exemplifies the triumph of surviving in order to share the stories that often go untold. In the end, WELL is an invitation to ask what happens when, instead of asking why God allows suffering to happen in the world, we ask, "Why do we?" SARAH THEBARGE is an international speaker and the author of The Invisible Girls, named a World Magazine 2013 Notable Book. Sarah earned her physician assistant degree at Yale and was studying journalism at Columbia when she was diagnosed with breast cancer. In spite of nearly losing her life to cancer, she went on to care for refugees in the United States and provide medical care to people living in the developing world. In addition to practicing medicine in Togo, she served in the Dominican Republic and started a clinic in Kenya for children who lost their parents to AIDS. Sarah is a spokesperson for Compassion International. She returns to San Francisco when she is not traveling the world. "Sarah's story-telling is so engaging that you won't want to put this book down, but it is her heart that will grab you. Her observations are honest and gritty at times, and you will wrestle with her through difficult tensions. But in her exploration of brokenness, you will also find grace and beauty. On a planet loaded with pain, death and poverty, Sarah's words are a gentle reminder that each of us is called to participate in the healing of our world as we seek to follow Jesus." "Sarah Thebarge's WELL doesn't simply teach us about God's love and compassion in a world of suffering, but takes us on a journey with her to experience God's healing in the places most of us would rather not go. Courageous, vulnerable and uplifting, you will be equally enchanted by Sarah's daring and her writing as she reveals the faces of people God loves and Christians often forget. "—Sean Palmer, teaching pastor at Ecclesia Houston, author of Unarmed Empire. "WELL shook me from my comfortable suburban life and thrust me smack dab into Jesus' heart for those who suffer. I was back in Africa, learning deeper lessons about trust, loss, and the God who walks alongside us in trauma. I'm grateful for Sarah Thebarge's honest portrayal, her grappling with the questions we'd rather not ask, and her ability to agonize with the broken. I'll be thinking about this book a long time."